I have written about Lowell Bennion a number of times in various books, first here in Gregory Prince’s David O. McKay and the Rise of Modern Mormonism, here in Gregory Handley’s personal tribute to Lowell Bennion, and here in Conscience and Community, a look at the intersection of personal ethics and religion through the lives of Sterling McMurrin, O. C. Tanner, and Lowell Bennion. But I hadn’t yet read an original work by Bennion! His entire approach to the gospel seemed so true to me, an approach that doesn’t often seem to be entirely replicated in the hierarchical/organizational Church. I think that’s because he clearly states that his first priority is to people and to God before the Church. There are talks that the Church and the gospel are different (here and here), but this clear order of priorities often doesn’t seem to come through in the priorities of individual members. And perhaps that comes off as threatening? Or non-committal? We cannot use God, or our belief in God, to dismiss other people’s pain. Sometimes, this means listening to things that make us uncomfortable or challenge our beliefs. It means allowing people to speak ill of things that we think well of—including (and perhaps especially) ourselves. And it means listening compassionately to those who criticize, contradict, or seek justice from God or from the human institutions that claim to represent Him. God can take care of Himself; our responsibility is to take care of each other. Brothers and sisters, I have nothing against the things that were said. I am deeply grateful for the Word of Wisdom. I pay tithing, and I do it gladly. And I believe in going to church and worshipping God there and enjoying the fellowship of my brothers and sisters. I delight in church service. The thing that grieves me about these answers is not what was mentioned but what was unmentioned. I do not know how you folks feel here, but in Salt Lake under the shadow of the temple and where I teach, I find that many students and many young people have reduced our religious life to a pattern of performances and of obedience to a few rather unique things in our gospel. Among the documents are also letters to his wife while he was serving a mission in Germany, as well as practical advice in topics like education and dating. Many of the items are pulled from gospel doctrine manuals, of which Bennion wrote no a few (I wish we had manuals of this caliber today!). 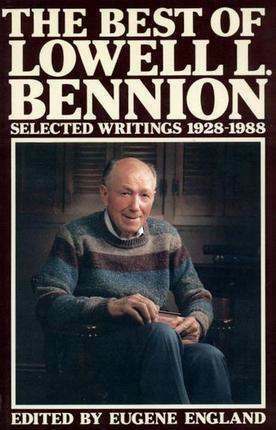 Bennion is a model to me of a true Christian life in the context of the Latter-Day Saint tradition. I would aspire to live a similar life that is outwardly directed. But first I will have to get off Twitter so much and get my hands dirty.